If you’re a small business owner or entrepreneur, you’ve probably learned quickly that negotiation is not only unavoidable in business – it’s critical to the success of your company. And yet negotiation is not a skill that everyone is comfortable with or excels at. It is, however, one that you can improve upon with practice. The 7 tips below may help you succeed in your business negotiations. Preparation is key. This includes knowing about the company, its competitors, and its products or services, as well as the individual you are negotiating with. What are their strengths and weaknesses? Do they have the authority to make decisions that bind the company? You should also be sure to think through your options before engaging in discussions. Know what you want and come prepared with data to back your demands up. You should also know what your walk-away point is. #3. Listen to – and understand – the other side’s issues. The best negotiations are ones where you can see the situation from all angles. Once you understand where the other party is coming from, you will be better able to find out where there’s flexibility. In this way, you can come up with the most appropriate response and determine the right solution. #4. Be collaborative in your negotiation efforts. 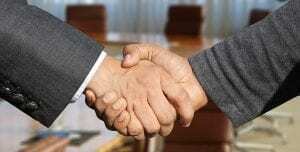 Many business owners believe that they can win negotiations by playing hardball. And while there are times when this is necessary, one of your goals should be to establish a good relationship – and trust – with the other party. After all, a collaborative tone is more likely to help you get to closing the deal. #5. Don’t get hung up on one issue. Few agreements come down to only one element, such as price. It’s more common to have multiple issues that you’re dealing with. This increases the possibility of a mutually beneficial outcome since certain terms or conditions may be more important to you than the other party and vice versa. And if you’re stuck on one issue, suggest setting it aside so you can make progress on other issues. Not only will the smaller wins keep the momentum going, but you may be able to come to a creative solution. #6. Prepare a letter of intent to reflect the deal’s key terms. This helps the deal move forward and ensures the parties agree on price and other key terms before investing significant time, resources, and legal fees in pursuing the deal. #7. Retain an experienced corporate lawyer to negotiate the legal terms of your deal. Negotiating is an important part of the training of a corporate lawyer. You want an expert on your side from the very beginning of your negotiations to ensure your rights and interests are protected. This is true whether or not the deal is a complicated one. And certainly, if the other side has a lawyer, you should have one as well so you are on equal footing. Anton M. Katz, Barrister & Solicitor has 22 years of corporate law and commercial litigation experience. Contact our office today for your free initial consultation. We look forward to hearing from you.